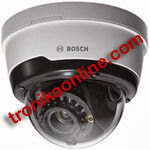 The Bosch NDN-265-PIO HD 720p infrared IP dome camera is a ready-to-use, robust network camera. This camera brings Bosch’s high-performance technology into the realm of small office and retail businesses by offering a cost-effective solution for a broad range of applications. This robust dome camera is IP66 rated, offering water and dust proofing for demanding environments. The built-in IR LEDs provide quality night time monitoring with 15 m (50 ft) viewing distance in darkness. The H.264 compression technology gives clear images while reducing bandwidth and storage by up to 30%. Weight 1.07 kg (2.36 lb) approx.